Having finally skied to and from the summit of Shastina on Memorial Day (see TAY report), I was ready to hit some other big lines on Mount Shasta's prominent 12330 ft satellite. 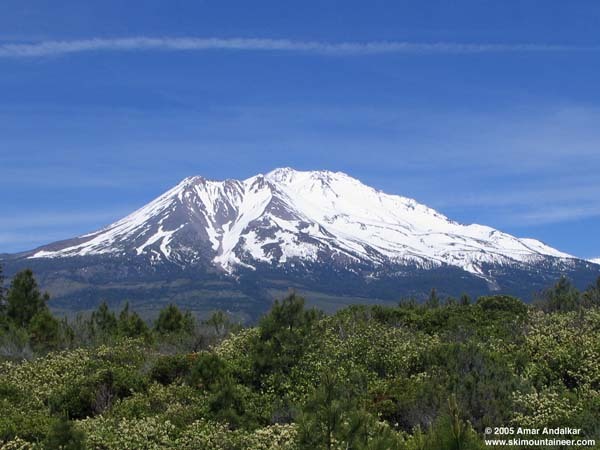 Jeff Huber said he'd be on Shasta for the weekend, so I made plans to meet him and try Diller Canyon on the west side of Shastina on Saturday, followed perhaps by a one-day attempt at the Whitney Glacier or the North Face of Shastina from the North Gate trailhead. After car camping Friday night at Bunny Flat to acclimatize, I drove down to meet Jeff for breakfast at the Black Bear Diner and then we headed for Diller Canyon around 8:30 AM. With the freezing level expected to be near 10000 ft, I figured a leisurely start would be fine, with optimal ski conditions on the west and NW facing slopes around 3-4 PM or later. Occasionally clouds swirled around and hid the mountain, and I often feared the worst (another day of whiteout!). The irregular grid of logging roads in the "Plantation" on the west flanks of Shastina would have been difficult to navigate without the help of the new Mount Shasta Wilderness Recreation Map (Wilderness Press, 2005 edition), which shows the roads very nicely. Unfortunately, the last few miles of Road 41N86 are in abominable condition, probably the worst road I've ever driven on outside of British Columbia. The road surface consists of loose rocks and boulders, fist to head size, with dense scratchy brush encroaching and narrowing the right of way in several spots; only vehicles with 4WD, high-clearance, and an expendable paint-job should attempt it. At the final fork at 6750 ft, the left fork to Diller Canyon looked to be impassable, and we decided to hike up and inspect it first. Several fallen trees nearly blocked the road, but all had been chain-sawed just short enough to allow a daring driver to slowly weave through. We hiked past the 7125 ft high point (a huge log blocks the road completely just after that) and followed the descending and contouring road into Diller Canyon. A few steep snowdrifts filled the road, with a steep crumbly drop-off into the canyon on the left, making for a somewhat sketchy hike in our shoes. Luckily the hard frozen snow had softened just a tiny bit, enough to kick some toeholds, and we hiked all the way into the floor of the canyon, where we were relieved to find that the route looked like it would still go on continuous snow the whole way from 7200 ft to the summit (yes, the snow was continuous in the woods despite what it looks like in the photo). Best of all, the snow started less than a 5 minute hike from the last driveable point. We headed back to get the cars and drive the last perilous half-mile to 7125 ft. The 5 miles from Everitt Hwy had taken nearly an hour to drive, plus nearly an hour of round-trip hiking, and so we finally headed up in our AT boots at 11 AM. Pretty late, but what can you do? After the brief hike to reach snow, we skinned up through the woods at the right side of the canyon, with some deep tree wells and a couple of short bare patches. We reached the edge of the central gully (a deep U-shaped trough about 80 ft across, carved by mudflows) at 7500 ft and were relieved to find it completely snow-filled to just below the point we reached it. Best of all, the clouds were rapidly dissipating and it was becoming an absolutely beautiful day. We skinned directly up the middle of the gully, noticing some fresh crampon point tracks in the still-frozen snow. Somebody else was up here! (Later I discovered that a 10X zoomed photo I had taken during our hike clearly showed three snowboarders climbing up -- but totally invisible to the naked eye.) Above 8500 ft, the old dirty snow was covered by a layer of new snow from the previous week, extending all the way up the canyon. On and on we skinned up the endless canyon, until suddenly around 1:30 PM we saw snowboarders, high above us, dropping in at the very top of the canyon. Turns out this was MW88888888 and his brothers, but they rode past us with only a brief wave and hello. The upper part of the canyon above 10500 ft steepens to perhaps 35 degrees, and I was forced to put the skis on my pack and crampon up. Jeff, however, continued to skin, cutting innumerable switchbacks up the steep face, and quite impressively he was able to skin all the way up into the crater. The snow conditions in the upper canyon were 4-6" of partly-consolidated recent snow over a firm base, ideal for both skinning and climbing at this late hour. It was almost 4 PM by the time I reached the floor of the crater at nearly 11800 ft, with Jeff perhaps 20 minutes ahead of me. I followed the snowboarders' boot pack to the summit, while Jeff continued skinning all the way to 12200 ft, just below the summit pinnacle (view a 5-image panorama of Shastina's crater and summit, at 2 resolutions: 2000 or 4000 pixels wide). At this point, the snow was frozen solid and the pleasant breeze in the canyon had becoming a roaring 30 mph wind, with stronger gusts to 40+ mph. We both cramponed up the final stretch to the summit, topping out a bit after 5 PM. A minute or two was all we could linger at the summit in the high wind before seeking shelter in some rocks about 30 ft below and to the north. We quickly donned our skis and skied NW into the crater, on firm wind-packed powder which had difficult breakable crust in a few places. The upper part of the canyon was still crusty in spots above 11000 ft, but generally the skiing was good. Below that the slope turned to very fine corn, still excellent even after 6 PM, especially perfect on the steeper NW aspects all the way to about 8000 ft. Below that, the skiing became more challenging through the rocky minefield of the gully. After exiting the gully, we skied the sticky glop in the woods all the way down to 7200 ft, and hiked back to the car just after 7 PM. It was a fantastic day, with good to excellent snow conditions and beautiful weather (other than the summit winds), 5100 vertical ft of skiing down a magnificently direct route. Diller Canyon is a great ski, but anyone who says that it's a good route in mid-summer is full of it. Despite the deepest June snowpack on Shasta in many years, we just barely caught the route in time for a full top-to-bottom ski. The part below 8000 ft will soon rapidly melt out, and increasing rockfall will make the floor of the upper canyon very hazardous. I think Diller Canyon is a great spring ski route, and probably best done when the nasty last miles of road above 6000 ft are still snow-covered. The west side of Shastina (left) and Shasta from I-5, with Diller Canyon the central funnel-shaped cleft in the face of Shastina. Our ski route followed the snow-filled right side of the canyon. Click here for an enlarged version of this photo. This topo map shows a GPS track of our route (thanks Jeff), with the ascent route in blue and the ski descent in red. Amar - great photo of the three of us, I'll treasure it. It's funny you mention the north face of Shastina. We did Diller as a substitute for the north face. Reason being the access issue - we had just skied the Bolam Glacier and were taking a "rest" day on Diller! The access to the north face sure is a conundrum for an otherwise spectacular ski. We skied off the summit at 1 after having lazed around the top chatting up some folks skiing down the Cascade Canyon side. We skied down into the crater couloir and found *almost* powder from the new snow you mentioned. And your remark about the length of time the canyon appears to be skiable - spot on. I had every intention of skiing it last year on July 4th. Ended up on the usual suspects, the canyon was bone dry and only the huge cornice remained. Lastly, bravo on the drive up that access road. We called it quits at 6,000, at the right hand turn where the road goes up and the condition goes down. Another great and very useful report, Amar. Keep up the great work. That book's going to be a great tool. Nice pix Amar, and I agree with Michael, that road was a beast; we all said a few times that it was the crux of Diller. Ditto that! Excellent report, Amar! MW8 and RonL, it was nice to see you. Feel free to stop and say hi anytime you want. We didn't expect we'd see any other parties in the canyon, and your presence was a surprise. MW8, for the NF of Shastina we had discussed traversing in from Northgate with an ascent of the Whitney gl to the Shasta/Shastina col.
One last photo: As I was driving back to Portland Tuesday evening upper clouds were beginning to build obscuring most of the mtn except for Diller Canyon. I couldn't resist pulling over to take a photo.